In this section we discuss about angles are formed by Parallel Lines Cut by a Transversal line like corresponding angles, Alternate interior lines, Alternate exterior angles , co interior angles and co exterior angles. Also learn about properties of the same angles. The transversal line is defined as ” A line which intersects two or more lines at distinct points”. Here ‘ l’ is a transversal for the lines of ‘ m’ and ‘ n‘. In the above figure ∠3 , ∠4 , ∠5 & ∠6 are called interior angles since those angles lie in between two lines. In the above figure ∠1 , ∠2 , ∠7 & ∠8 are called exterior angles since those angles do not lie in between two lines. i.e outsider of the two lines. In the above figure ( ∠1 , ∠5 ) , ( ∠2 , ∠6 ) , ( ∠3 , ∠7) , (∠4 ∠8) are the corresponding angles. 2. One is an interior angles and the other is an exterior angle. 3. They are not adjacent angles. Two angles are said to be Co-interior angles if they are interior angles and lies on same side of the transversal. The Co-interior angles also called as consecutive angles or allied interior angles. So in the below figure ( ∠4, ∠5) , ( ∠3, ∠6) are Co-interior angles or consecutive angles or allied interior angles. 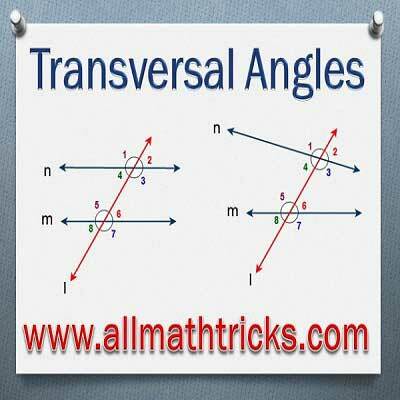 Two angles are said to be Co-exterior angles if they are exterior angles and lies on same side of the transversal. So in the above figure ( ∠1 ∠8 ) , ( ∠2, ∠7 ) are Co-exterior angles. If the sum of two adjacent angles is 180o, then they are called a linear pair of angles. In the above figure ( ∠1 , ∠3 ) , ( ∠2 , ∠4 ) , ( ∠5 , ∠7 ) , ( ∠6 , ∠8 ) are Vertical Opposite angles. Thanks for reading. I Hope you liked this article “Angles formed by parallel lines and transversal Line”. Give feed back, comments and please don’t forget to share it.